I’m not lazy…I just don’t care. Once, when I worked at a job that had regular staff meetings that I quite abhorred, I found great and sacred solace in the profound film Office Space. How could it not provide a plethora of holy moments? Here, in this Citizen Kane of the late 1990s, the creator of Beavis and Butthead explored the inner workings of the cubicle worker in his native environment. But it wasn’t the beauty of the cinematography that kept me returning to this film time and time again. No, it was the concept of the film. Peter Gibbons, the protagonist of the film, is an office worker who hates his job and is in a relationship with a less-than-committed girlfriend. She talks him into hypnotherapy, in order to help him be happier. The hypnotherapist puts him into a stance where he does not worry about his job, he does what he wants to do with no anxiety about the typical workaday problems that plagued him before. Then, before the hypnotherapist can wake him up, the hypnotherapist dies from a heart attack. Suddenly, Peter is a free man, uninhibited by the societal and performance expectations that plagued him before and contributed to his unhappiness. Instead of seeking external factors to make him happy (like a new job), he instead is instantly happy and makes choices based out of that mindset. He stops showing up regularly for work. He dismantles his cubicle. He cleans fish in the office. In the middle of his change in behavior, his employer has brought in consultants to help “streamline” the organization. Peter’s boss assumes these consultants will recommend they fire Pete, but instead they promote him. His attitude moves him ahead of his friends and on the fast track of success. The results of his non-anxious approach to work are not what is expected. We know he ought to be fired. After all, shouldn’t we all be worried about the details? Instead, he is rewarded for his indifference. In the early 2000s, the repeated viewing of this film helped me get through several committee and staff meetings. It highlighted for me the ridiculousness of the unnecessary anxiety in corporate culture. It vindicated the one who had it together and rose above the fray. While some of the humor of this film has been muted by the recent recession, Office Space still makes a valid point about the nature of worry in our modern lives. Our health as a nation and our relationships are effected as we spend so much time in the midst of worry and by and large neither clergy nor Christian congregants handle this stress any better than the general populace (and often worse). Of course, if I was Jesus I would have been worried myself. His disciples were worried about him. After all, people were trying to kill him. People were trying to get him to be different than he was. People were trying to trip him up. He should have been worried. He was in the cross hairs of an entire culture. And yet, Jesus seemed to not worry, even when he wanted the cup to pass. What we should expect is that his lack of anxiety and his refusal to capitulate to popular opinion should see his undoing. He wasn’t even trying to get along with people. He was being himself, a most dangerous thing to do in the societal mix of meeting expectations and keeping up appearances. And it is being himself, his wholly loving self, that gets him killed. Our expectations were correct. He didn’t play the system and so he paid the price. Good Friday shows that his bucking of the system got him exactly what our minds tell us it should – undoing and suffering for refusing to play by the agenda of the world. But we are not a Good Friday people; we are an Easter people. All the events of Easter – the empty tomb, the outrageous joy, the resurrected body, etc. – are a divine reversal of our expectations of Jesus’ deserved failure for not working the system. God, in vindicating the life of love, becomes like the Bobs (the consultants) from Office Space, promoting the one who should have been fired and undone. I haven’t really figured out how to live without anxiety and worry while being my self. But I do know that learning to see myself as God sees me and be that person without anxiety are marks of a deepening faith. I also know that it is that freedom of self and lack of anxiety that communicates best to the world that our faith is powerful and important. I’m pretty sure that is not the message our worry conveys. Maybe I’ll start by realizing that the resurrected Christ is the same one who said not to worry. 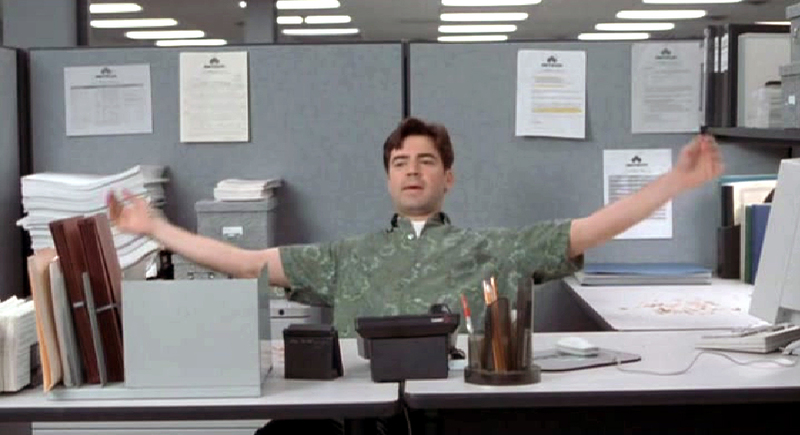 Maybe I’ll watch Office Space, not to get through meetings, but to ponder what a worry free life would look like. Maybe I’ll pray for eyes to see that the tombs and crosses in my life are the not the end of the story. Hopefully, by the grace of God, I’ll figure out how to be free of worry and free to love, just like Jesus asked me to be.